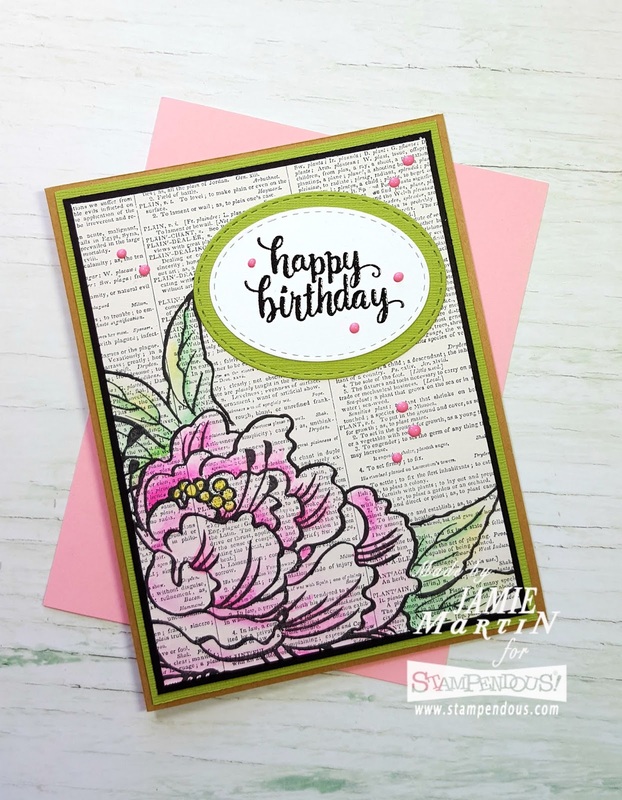 This week the Stampendous Design Team are sharing creations made with die sets. 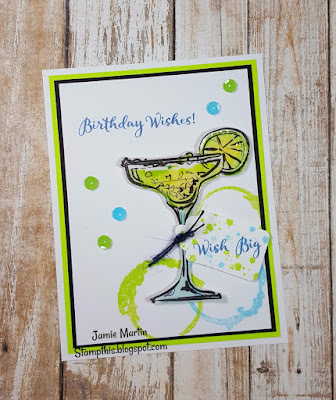 The die set used on my card is the Fitted Frames B Set, this set lets you create lots of luscious layers! 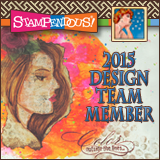 Be sure to head over the the Stampendous Blog to see what the other Design Team Members have for you this week. The link is at the bottom of the page. 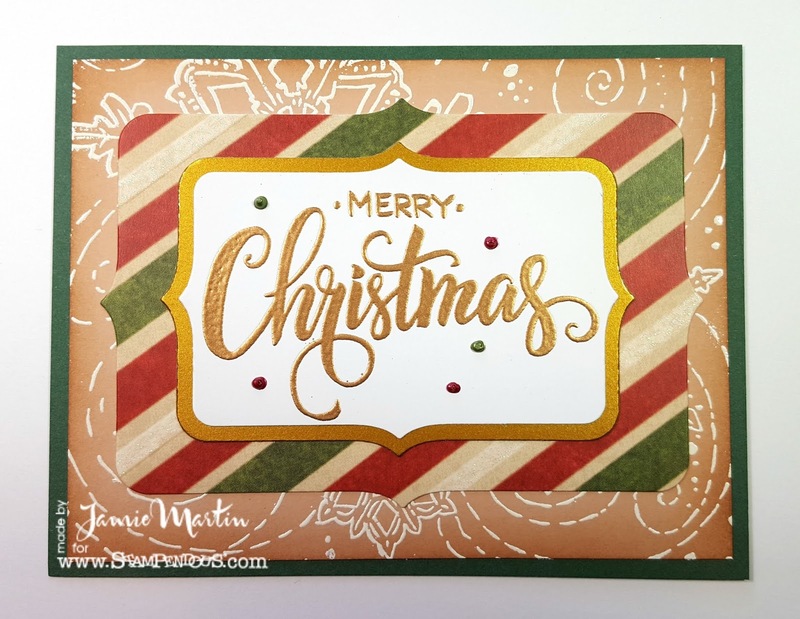 Stamp Merry Greeting with VersaMark and emboss with PEARLustrre Champagne Embossing Powder. Die cut Merry Greeting using Fitted Frames B Set, layer onto a large gold frame and layer again onto a larger Fitted Frame that was cut from decorative paper. Set aside. Stamp a tan panel with Cling Winter Blizzard with VersaMark Ink and emboss with White Embossing Powder. Sponge the edges of the tan panel with Antique Linen Ink and glue to a green card. Add a few dots of Bottle Green and Autumn Red Nuvo Crystal Drops around the sentiment. 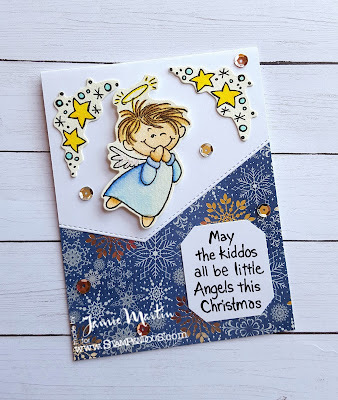 I made another card using the Delicate Snow Set from Stampendous and it has a completely different look than the one I made the other day (below). Today's card was made by stamping each of the snowflakes with VersaMark ink and embossing with white. 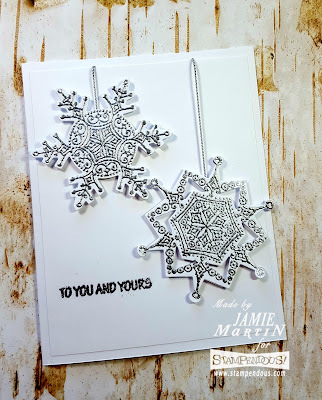 Then the stencil that comes with the set was placed over the snowflake, covering up the areas around it and Tumbled Glass and Faded Jeans Distress Inks were sponged on. The sentiment was stamped on a white strip of cardstock with Faded Jeans ink and embossed with clear. It was then layered onto a silver strip of paper. The strip was then glued onto the snowflake panel, which was layered onto a silver panel and glued to a white card. 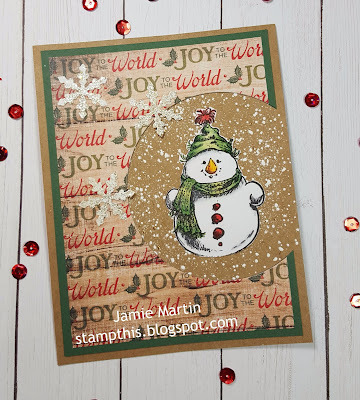 I'm squeezing in another Christmas in July card, this card is using the cute Snowman With Arms from Rubbernecker Stamps. He's colored with Prisma Colored Pencils and can be cut out with the matching Snowman With Arms Die. 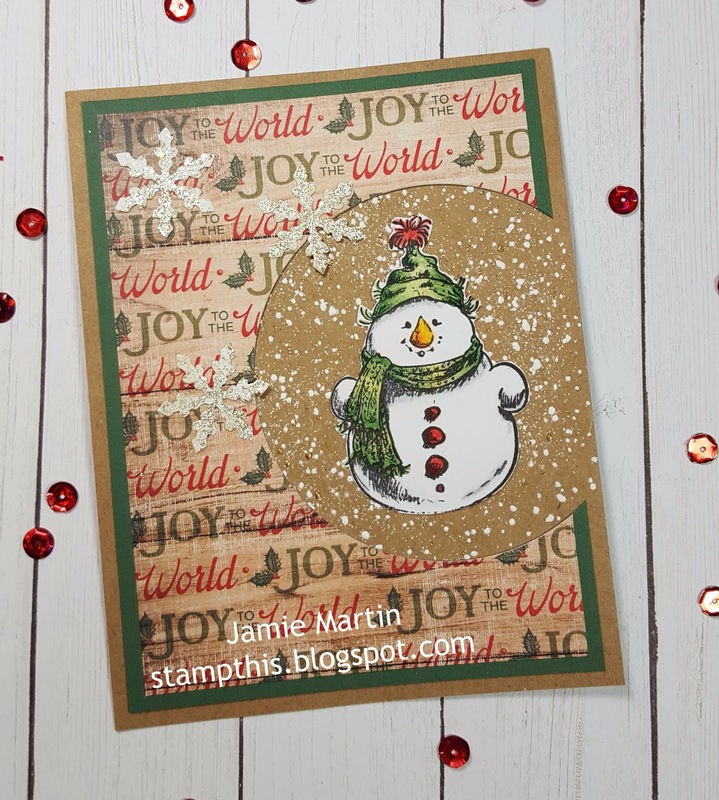 The decorative paper is by The Paper Studio and the snow behind the snowman is Shabby White Embossing Powder from Stampendous. The circle cut out was made with the Nested Circle Stitched Die Set. Disclaimer- I get free goodies for blogging about craft products! 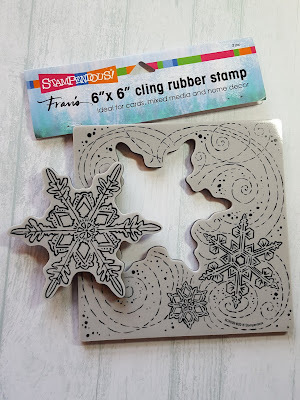 Today I'm sharing some fun new products sent to me from Rubbernecker Stamps and Stampendous. 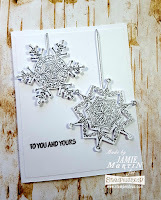 I love clean cards with a lot of white, the white makes a nice background for these Sterling Silver embossed snowflakes. The snowflakes are from the Delicate Snow Set from Stampendous. I used the matching Delicate Snow Die Set to cut them out. Stampendous is out of the Die Sets but you can still get them at Amazon, here's a LINK. The snowflakes were stamped with Delicata Silvery Shimmer Ink and embossed with Sterling Silver Embossing Powder. The sentiment is from the new Merry Words Perfectly Clear Set. 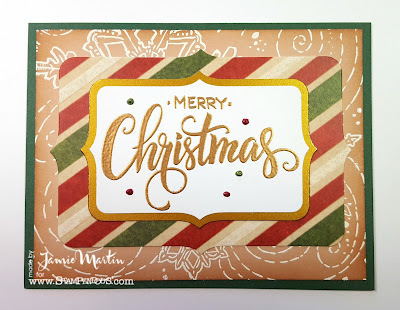 If you have a lot of Christmas cards to make this year, this is a great design to crank out in a short amount of time and it still has an elegant look. 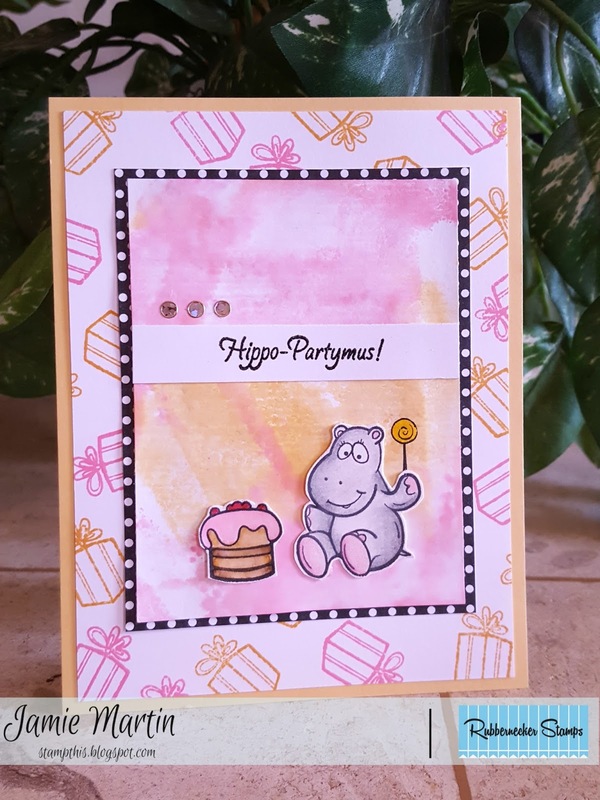 Today on the Rubbernecker Blog, is my Hippo-Partymus card, this Hippo Set is adorable filled with hippos, accessories, and sayings. As if that's not enough, there is also a matching Hippo Die Set available! 1. 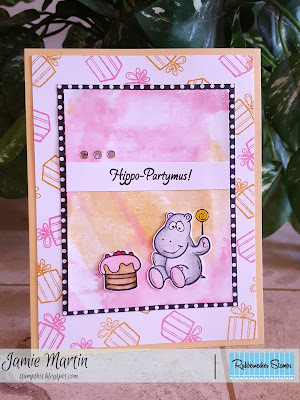 The present from the Hippo Set was randomly stamped on a white cardstock panel with Picked Raspberry and Wild Honey. It was then glued to a goldenrod colored card. 2. The watercolor panel was made by rubbing Picked Raspberry and Wild Honey inks on my craft mat, spritzed with water and laid a watercolor panel on top then lifted it up and let dry. 3. The hippo and cake were stamped with black and embossed with clear embossing powder. It was colored with Zig Clean Color Real Brush Pens (wow is that a lot to type!) and cut out. 4. The Hippo and cake were glued to the bottom of the watercolor panel and the lollipop was stamped with black and colored with a yellow pencil. 5. The sentiment from the set was stamped on a white strip of cardstock with black ink and embossed with clear. It was glued above the Hippo and three rhinestones were placed above that. 6. The watercolor panel was then layered on decorative paper and glued to the card. 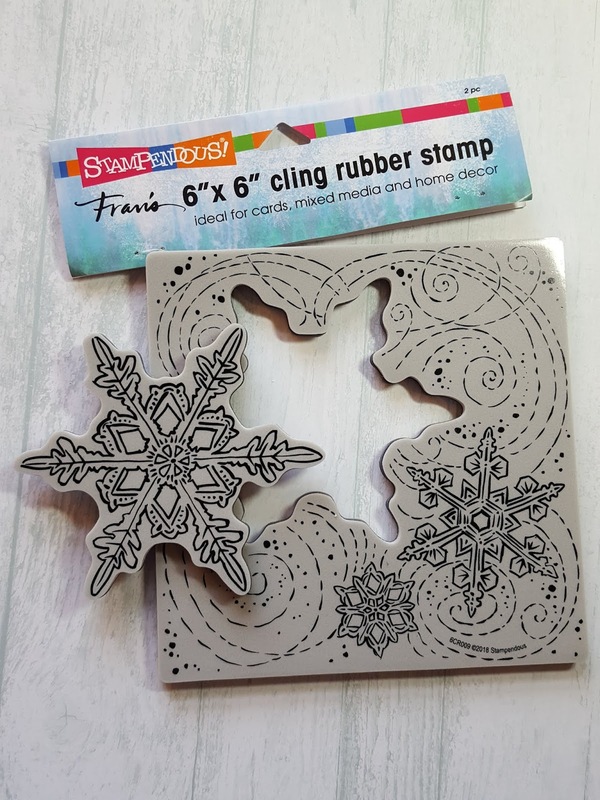 Today I have another 6 x 6 stamp from Stampendous, it's called Cling Winter Blizzard and what makes it really cool is that the large snowflake pops out! To make my card I stamped it on cardstock with VersaMark Ink and embossed it with White Embossing Powder. I then traced the popped out snowflake on printer paper, cut it out and used it as a mask while I sponged the panel with Tumbled Glass and Faded Jeans Distress Inks. 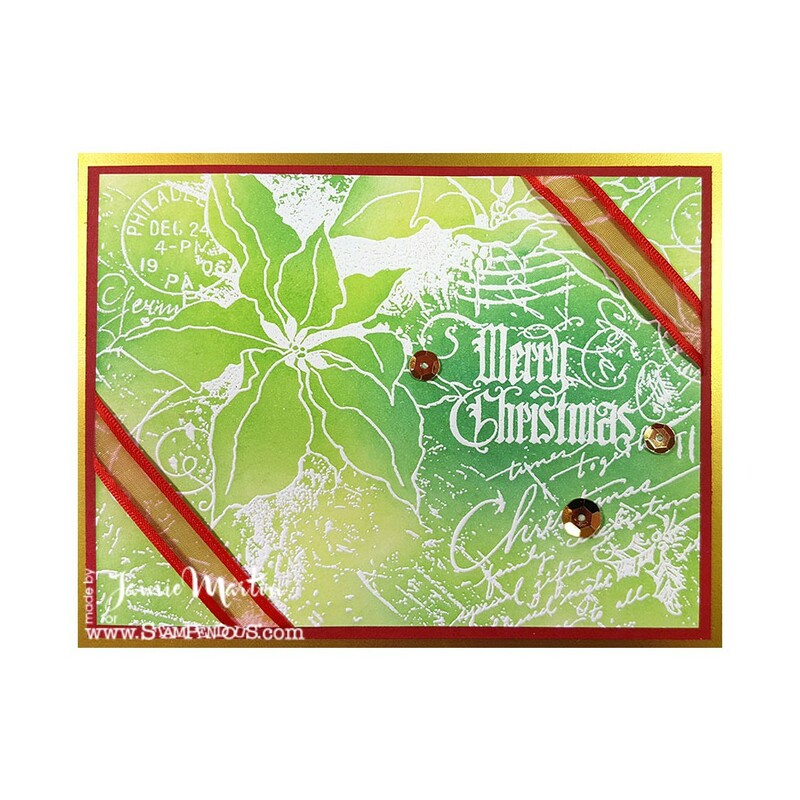 Joy from the Merry Words Perfectly Clear Set was stamped with Silver Delicata Ink and embossed with Silver Tinsel Embossing Powder. Stamp "To The World" below Joy with Faded Jean Ink. Then place Silver Dot Sparklers on the card as shown. Layer to a white panel and glue onto a blue card. 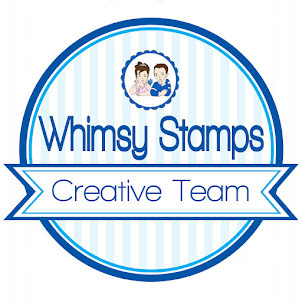 Stampendous has a new line of 6 x 6 stamps that are as beautiful as they are versatile. I used it to make a card but it can also be used for mixed media or stamping on decor, just let your imagination run wild. Stamp Poinsettia Collage on white cardstock with VersaMark Ink and emboss with White Embossing Powder. Rub your ink pads over the top of the embossed area using Twisted Citron, Mowed Lawn, and Pine Needles Inks. Spray with water so the colors blend and set aside to dry. When dry wrap two corners of the panel with red ribbon, glue to a slightly larger red panel and glue to a gold card. Glue three sequins on to add a touch of bling. 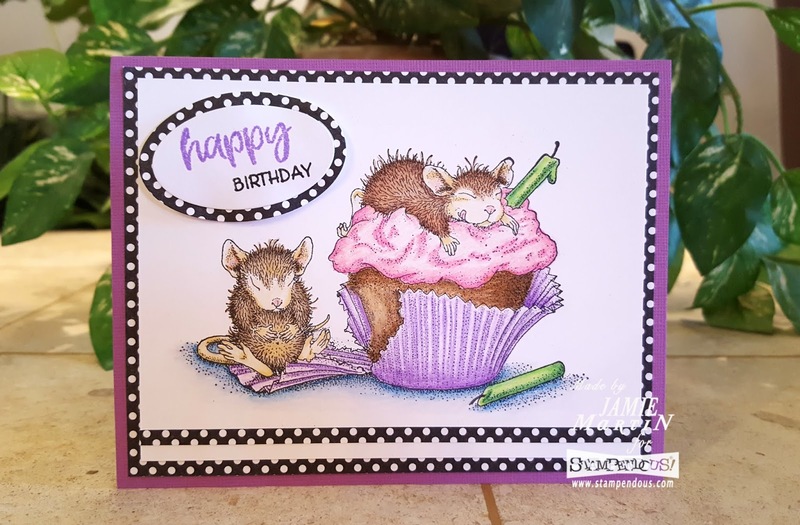 It's Throw Back Thursday and I'm sharing a card that was made in October of last year, it's one of my favorites! 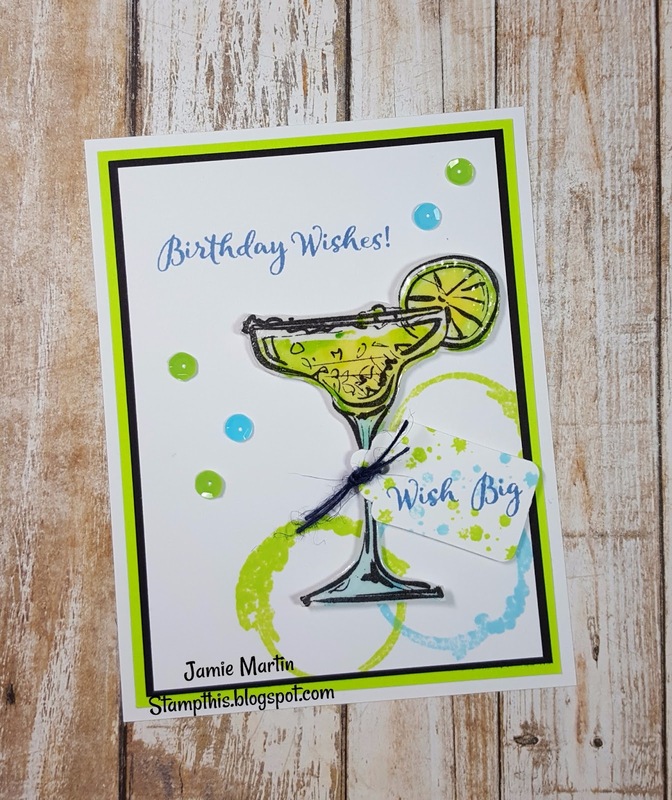 This is how I like to celebrate my birthday :) The stamps are by Rubbernecker Stamps, it uses the two-part Watercolor Margareta Glass, after the black outline stamp was used, the solid stamp was inked with Twisted Citron, Tumbled Glass, and Faded Jeans Distress Inks and stamped over the lined image. The glass stains and splatters were made with the Splatter Stains and the sentiment is from Best Friends Etc. Click on product names and it will take you directly to the item. Hi my stamping friends, I have a great pad of 6 x 6 paper from American Crafts, that I've never used and thought it was about time. I stamped it with the really pretty Fresh Peony Cling Stamp Set from Stampendous. I colored it with Zig Clean Color Real Brush Pens (Kuretake ZIG - USA), I was worried it wouldn't blend well on the paper, but it did well and I like how it turned out. The sentiment comes with the set and I used a couple of the dies form the matching Fresh Peony Cutting Dies Set. Pink dots were added with Enamel Accents for just a little touch of something. 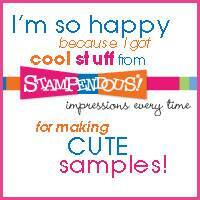 Did you know that you can share your projects made with Stampendous stamps on their Facebook page? We'd love to see what you're making!! 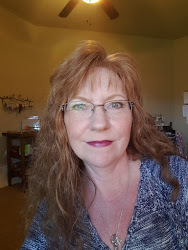 Just click HERE and take a look. Stampendous has a new line of stamps called QSet, with matching dies are available. The dies to these sets leave a little white edge, unlike their other dies and helps enhance the "cute" look. These stamps are made in the USA of Stampendous top quality materials. You can watch the new video about these sets and dies HERE. 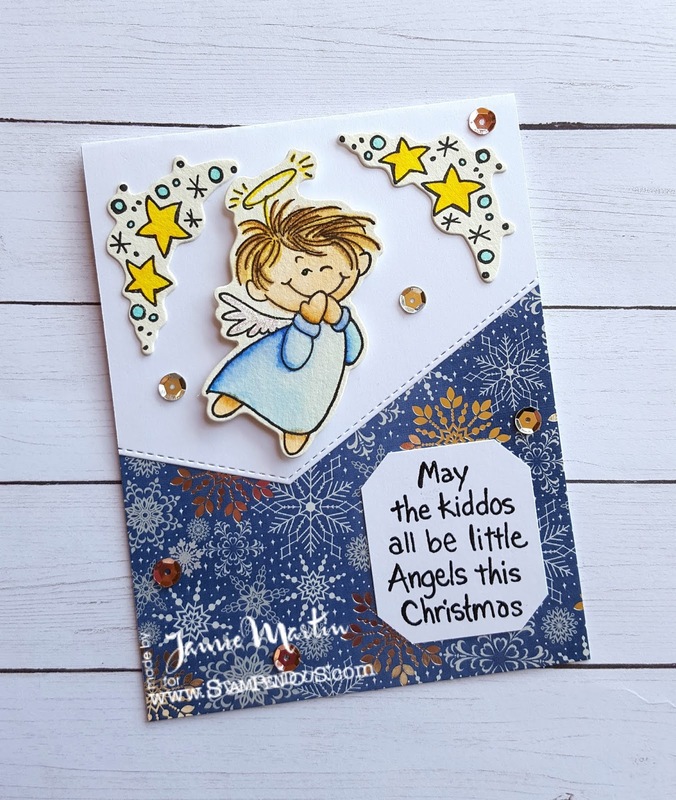 My card uses the Heavenly Kiddos Set and the Heavenly Kiddos Die Set. 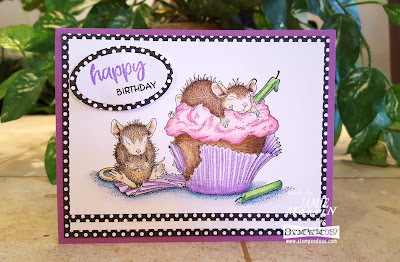 I'm up on the Rubbernecker Stamps Blog today with a card made with a bunch of new stamps and dies. The background was die cut using the Tree Panel #1 Die cut from green cardstock and glued to a white card with Art Glitter Glue. the Tree With Tire Swing stamp was stamped on white cardstock with Onyx Black VersaFine Ink and colored with Prisma Pencils. The Nested Circle Stitch Die Set was used to cut out the stamped image and the larger polka dot panel it's layered onto. This was then glued to the card. 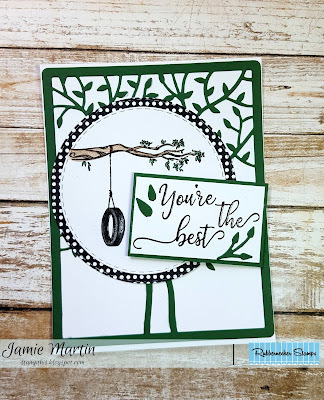 You're The Best was then stamped onto white cardstock with Onyx Black VersaFine Ink, embossed with clear embossing powder, layered onto a green panel and popped up as shown. The leaves were die cut using the Small Leaf Group Die from green cardstock and glued around the sentiment.